Dining Out: Derech Hagefen | Pop.Bop.Shop. I have really been looking forward to sharing this post with you. 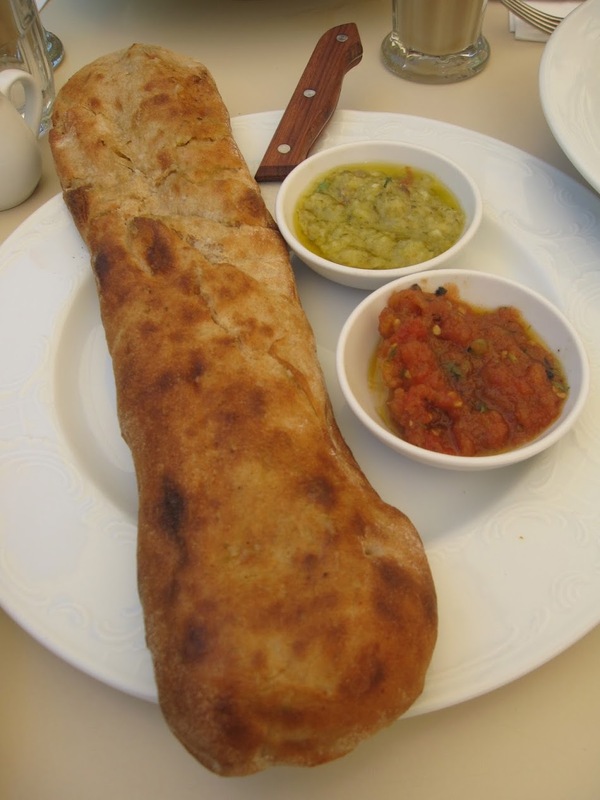 While I was in Israel in May one of my favorite experiences was a late lunch I had with my aunt and cousin at a restaurant called Derech Hagefen. 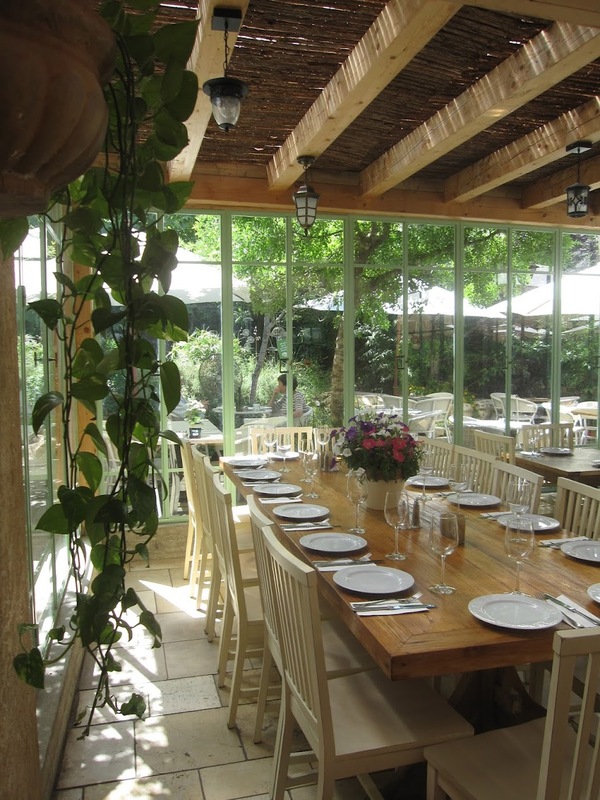 The restaurant is located in a neighborhood of Jerusalem called Beit Zait, adjacent to the Jerusalem forest. The entrance is stunning, with fuchsia flowers blooming in every direction. 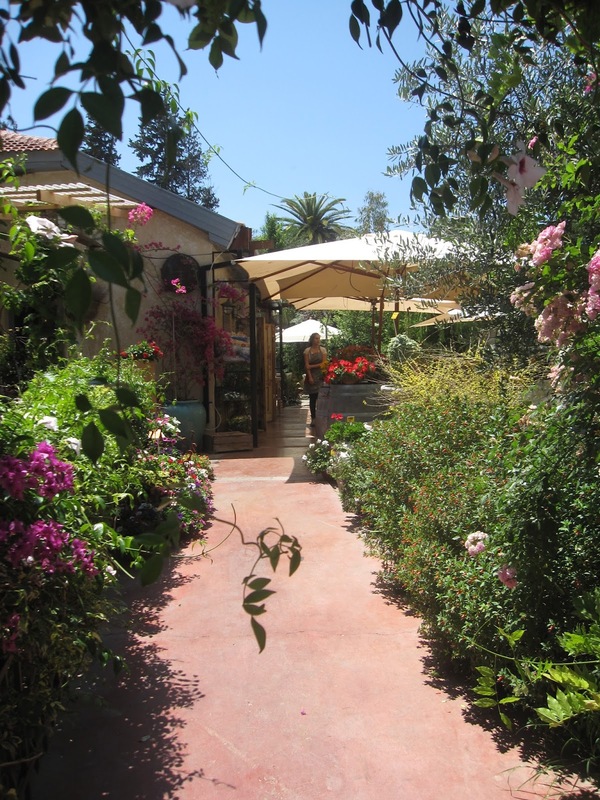 Right after you walk through the archway you see the restaurant's garden, complete with a watch dog. As you continue to walk down the path, you start to see big white umbrellas. At the end of the path is the most breathtaking outdoor patio. The tables and decor are all so adorable. The furniture reminded me of the items on display in Anthropologie. 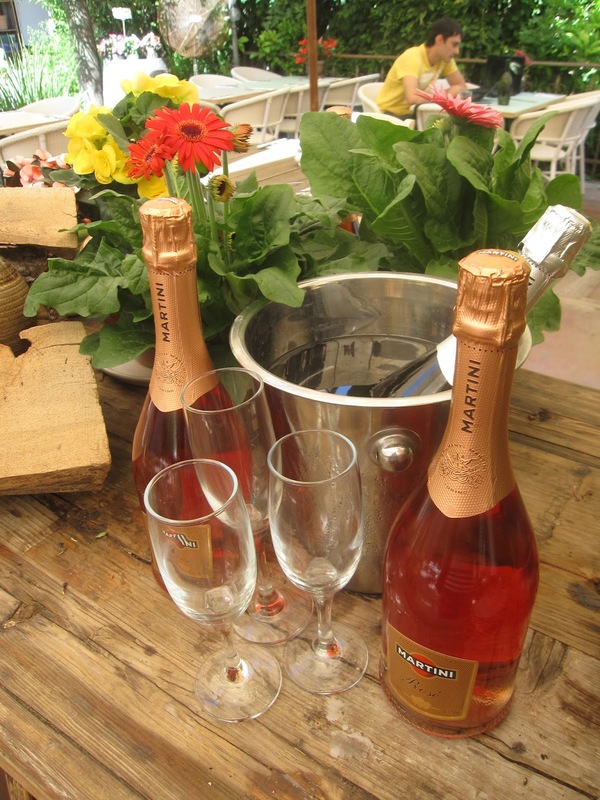 There was a center table beneath the umbrellas covered with potted plants and bottles of champagne. I loved this presentation and am planning to recreate it when I host parties at home this summer. 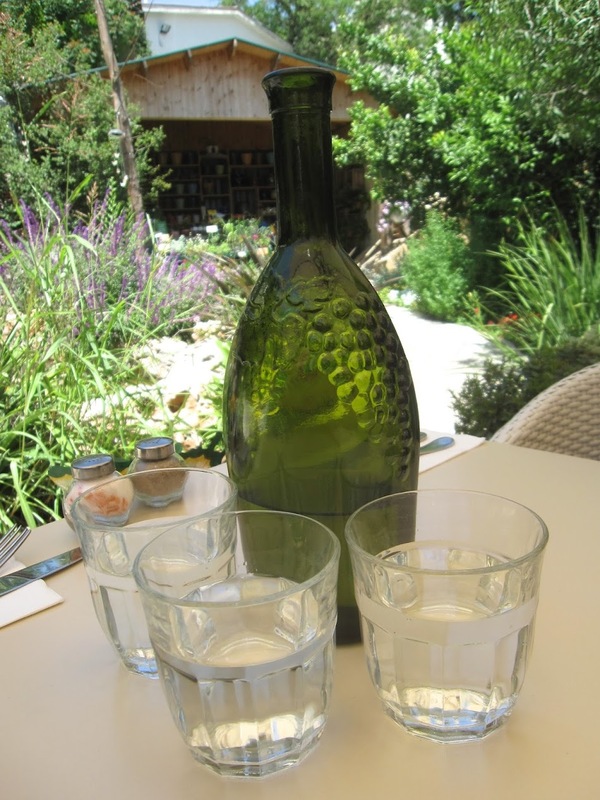 We started with water for everyone, which came served in this textured, green glass bottle. 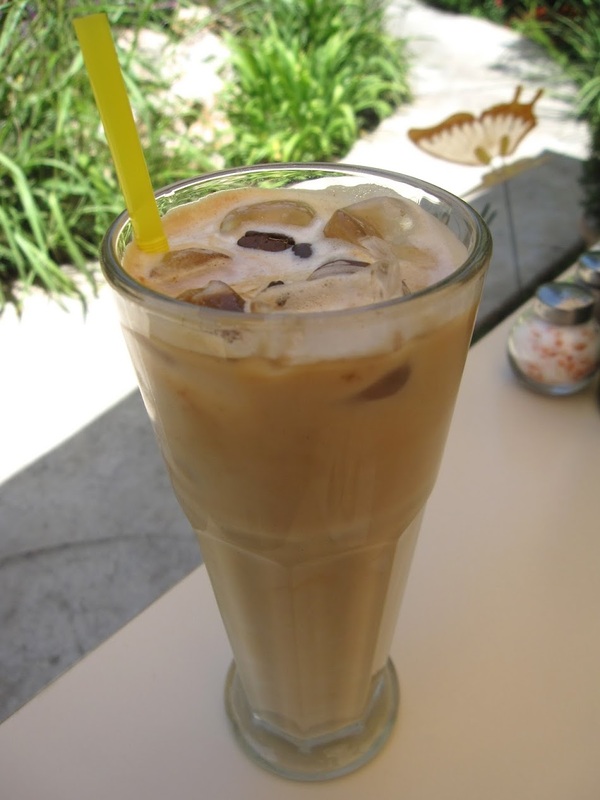 My aunt ordered ice coffee which looked especially creamy. Notice the actual coffee beans floating on the top. 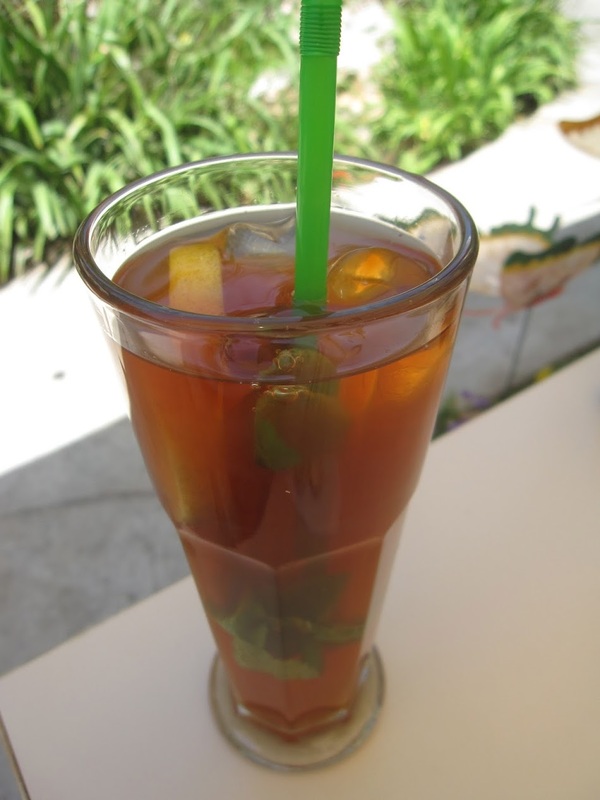 I ordered ice tea which was garnished with fresh mint (as all drinks in Israel are). To start we shared the focaccia bread, accompanied by two delicious spreads - one tomato and one artichoke. My cousin ordered the beet gnocchi and I can honestly say I have never seen a pasta dish with this kind of brilliant color or shape. How cool! She loved the dish and raved about not only the pasta, but the goat cheese sauce. My aunt ordered the mixed vegetable salad which was a huge portion and topped with all kind of veggie goodies. I went with the sweet potato salad which came piled high with cubed sweet potato as well as crunchy sweet potato shavings. It was fantastic! It felt like my salad was covered in potato chips. What could be better? 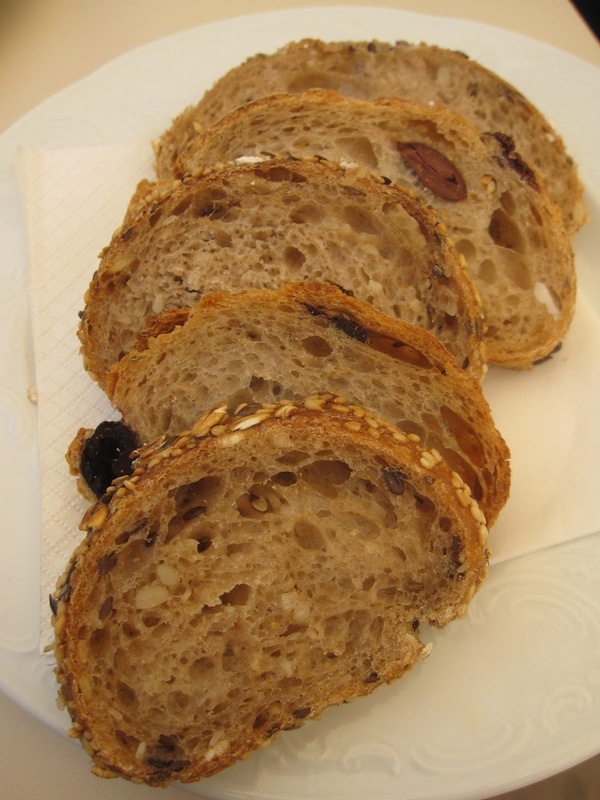 As if we didn't have enough on the table, the salads also came with a side of raisin bread. 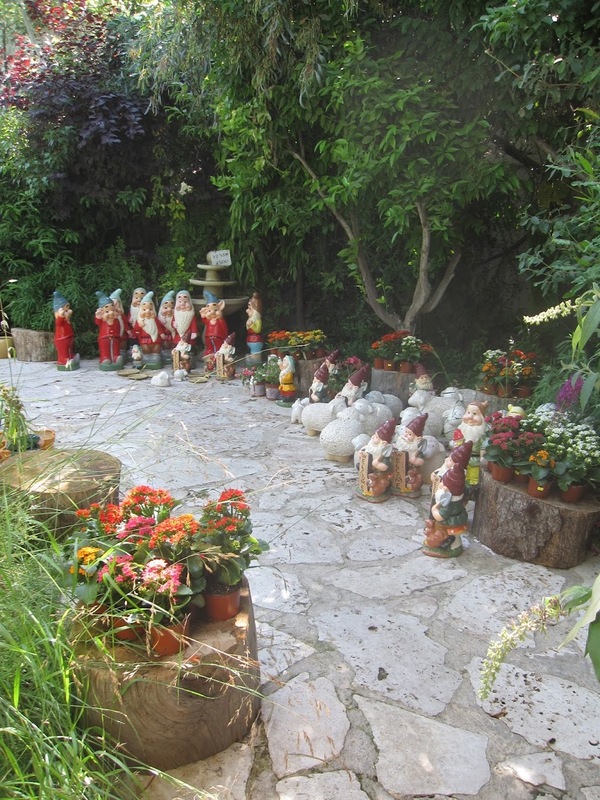 After we finished eating we walked around the property a bit, which included a section of garden gnomes for sale. This was just too funny! Don't they look exactly like the seven dwarves? There were all kinds of gnomes and garden animals - sheep, cows and bunnies. 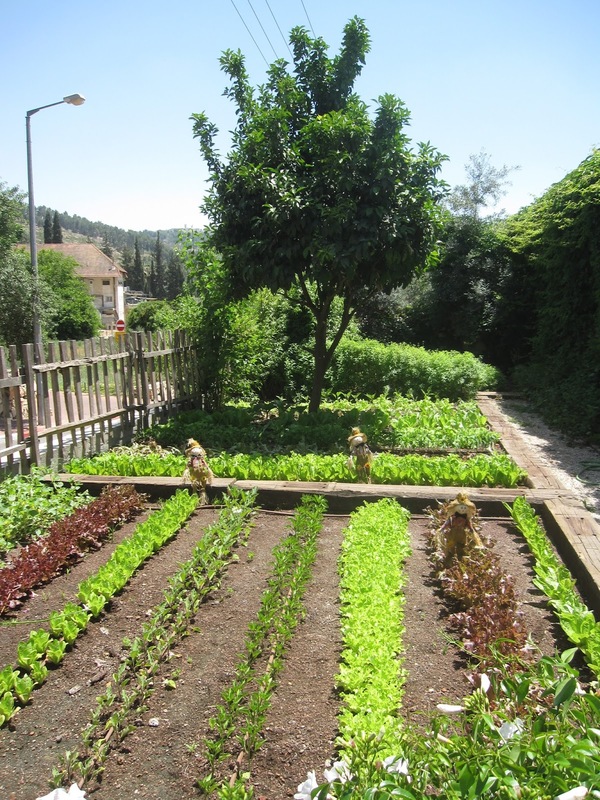 At Derech Hagefen you can also buy plants and flowers. They keep them right at the entrance to the patio. They also store blankets for guests in case it gets cold. I love that. Before we headed out I went inside to use the ladies room and that's when I spied their private room. How gorgeous is this? It would be the perfect place for a bridal shower. Our meal at Derech Hagefen was one of my favorite memories of the trip. 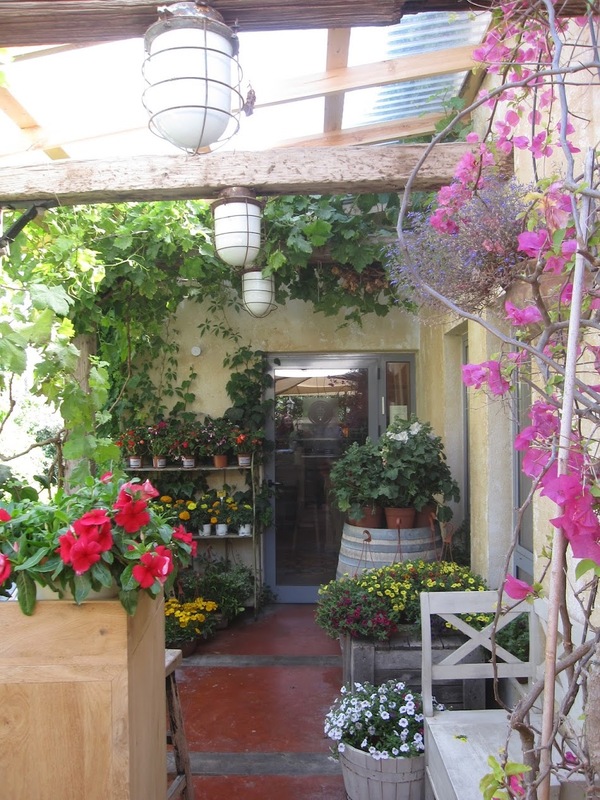 The sun was shining, the patio is beyond gorgeous and the smell of all the fresh flowers and herbs was exhilarating. 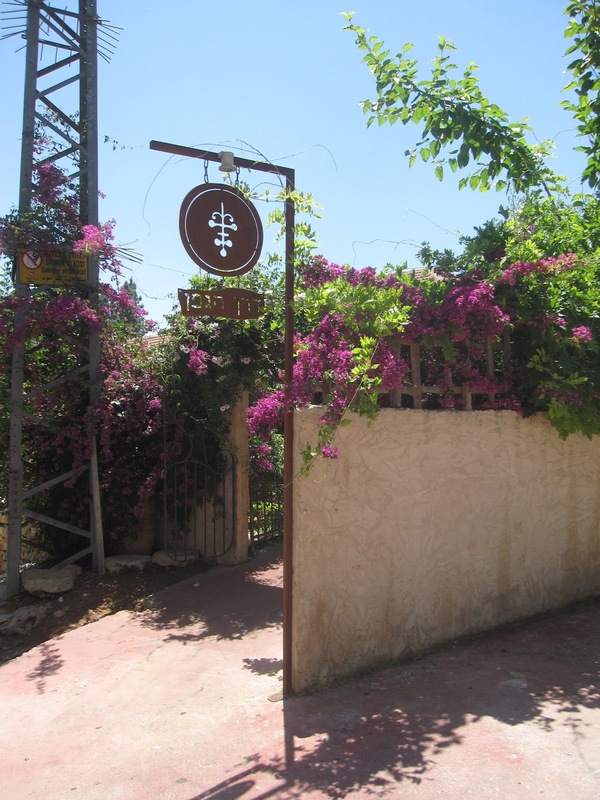 For those that live in Jerusalem, Derech Hagefen has a sister restaurant called Cafe Itamar that is at the entrance to Moshav Ora, just off the road to Hadassah Hospital. Absolutely make a point to visit either location. Now that you've seen my all time favorite patio, where is yours? incredible! a true slice of heaven. 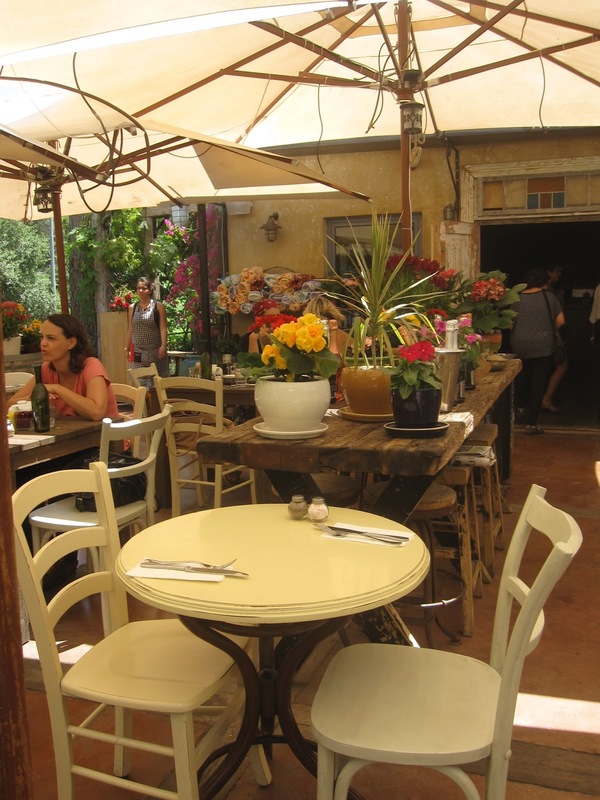 Anna Italian Cafe is the restaurant inside the historic Anna Ticho House in downtown Jerusalem. This is a kosher restaurant serving dairy meals. The pasta is excellent and you need to save room for dessert!